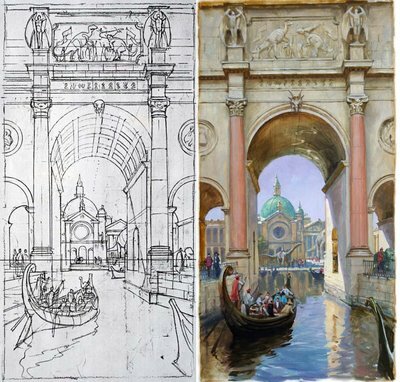 Not Another Architecture Student: FICTIONAL FRIDAY! Why are there dinosaurs walking in this street? 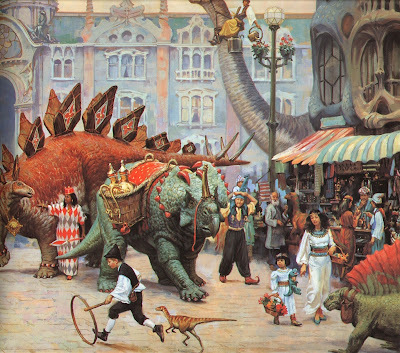 I'll tell you why: Because this is a painting from the fictional land of Dinotopia. Welcome to Fictional Friday! 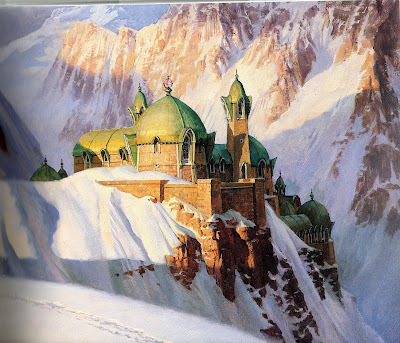 For quite some time now, I've been interested in fantastical and fictional architecture and urbanism from books, tv, films, computer games etc, and I've decided to start sharing some on this blog every Friday. 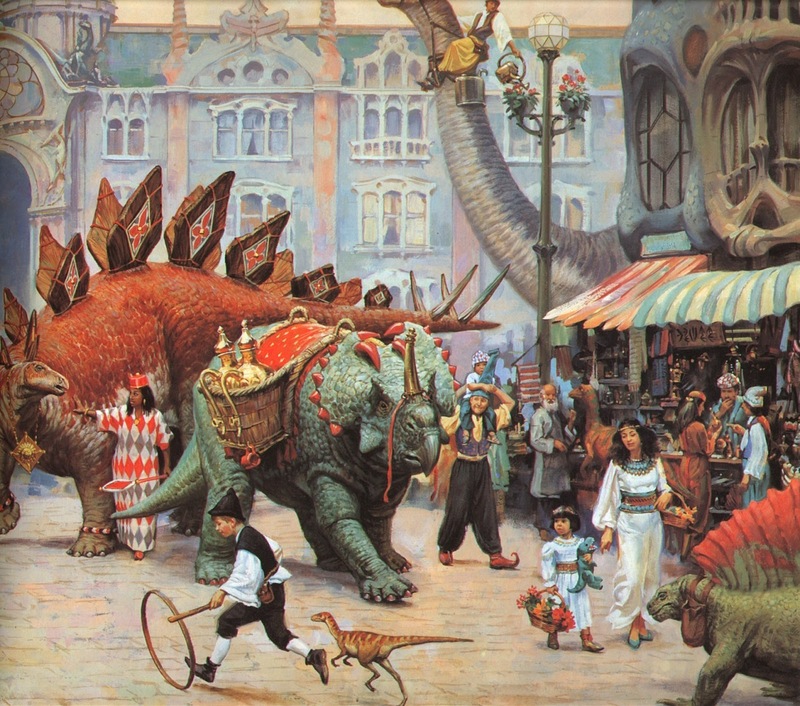 The opening archifiction is from James Gurney's Dinotopia. 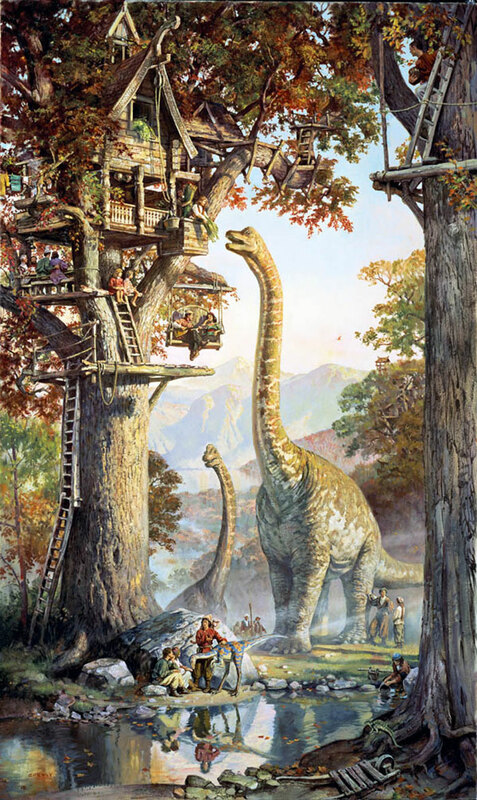 The Dinotopia series started with the publication of the first book in 1992, and made up of beautiful and compelling stories, set in a land where dinosaurs and human live together, in (mostly) peace and harmony . To me, however, what remains most interesting, is all the architecture and urbanism Gurney imagined for this world. Everything from farms and small villages to great cities and monuments fill the pages of these beautifully executed books. 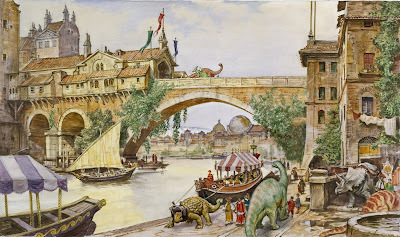 The references go to Italy, to Gaudi and Maya architecture among other things, and the result is an eclectic and intriguing mix that is both traditional and humanistic, and yet something very different. Gurney's drawings and paintings are almost nostalgic, all bearing a picturesque quality and warm glow which I'm sure is what captured my imagination when I forst got to know the work. Now, however, I think it's just as interesting to see how different scales meet in buildings and streets that are made for both dinosaurs and humans, like the different stairs in the top picture, or to see how the needs of humans and the dinosaurs can both be covered and combined through design solutions. Great books, herebu recommended to all lovers of fictional architecture and good stories. The first picture shows Steep street in Waterfall city, where one of the main protagonists lives. A view along one of the channels of Waterfall city. 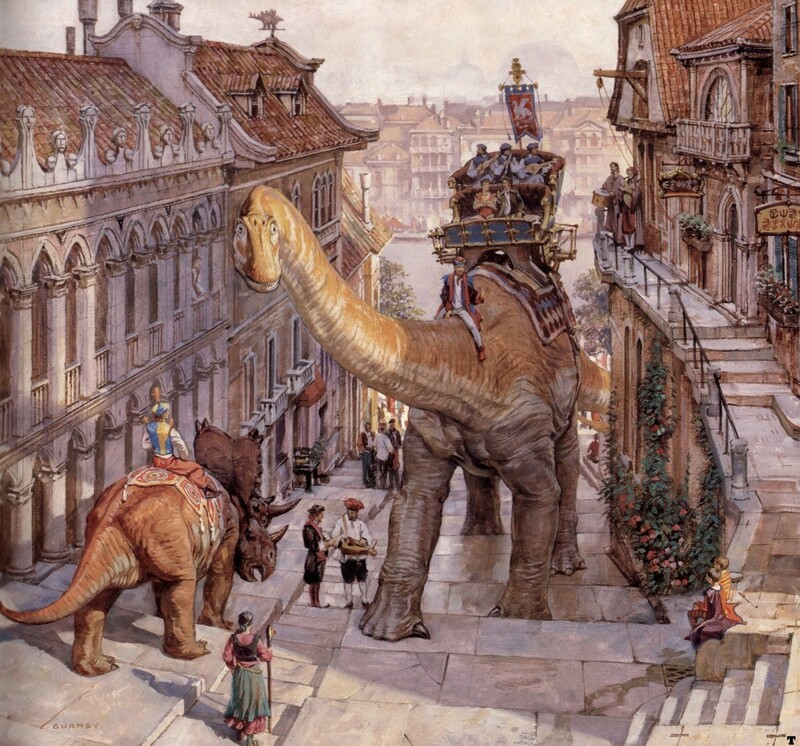 there are no really narrow streets in Dinotopia. 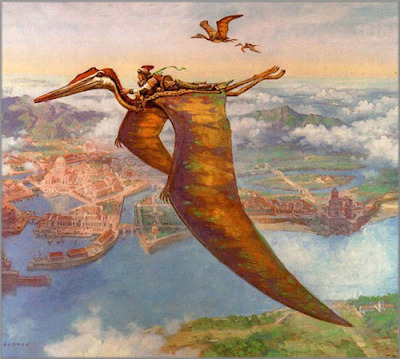 A detail of Waterfall city, with the huge globe and flying creatures transporting people back and forth. Gurney often makes maquettes for the design of buildings. I think he makes photographs and then paints after them. That's at least how he usually makes paintings and drawings of people. 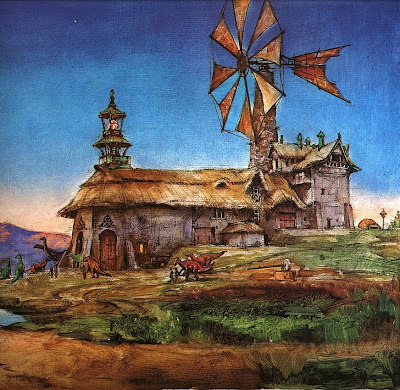 The Hatchery, a sort of farm, where the protagonists of the story are first taken when they arrive in Dinotopia. 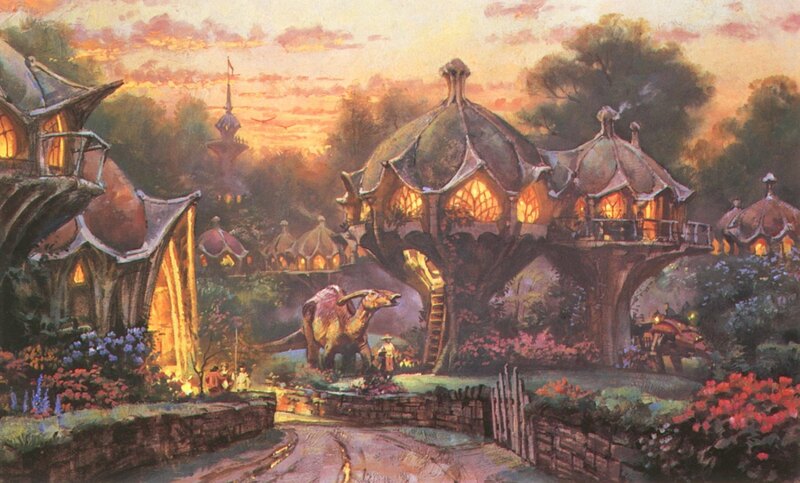 An almost-too-cute village of tree-shaped houses, borrowing some shapes form gothic architecture, built in an unknown material (maybe concrete?). In this painting, Gurney seems somewhat influenced by his infamous college friend, the late Thomas Kinkade. Tentpole of the Sky: Featuring Tibetan-looking architecture and old Tibetan-looking guys, this is a monastery of sorts built for seclusion and isolation. This image also shows how his paintings are based on drawings. Treetown, where houses are built at the hight of the heads of tall dinosaurs. This way humans and their tall friends can talk together face-to-face. 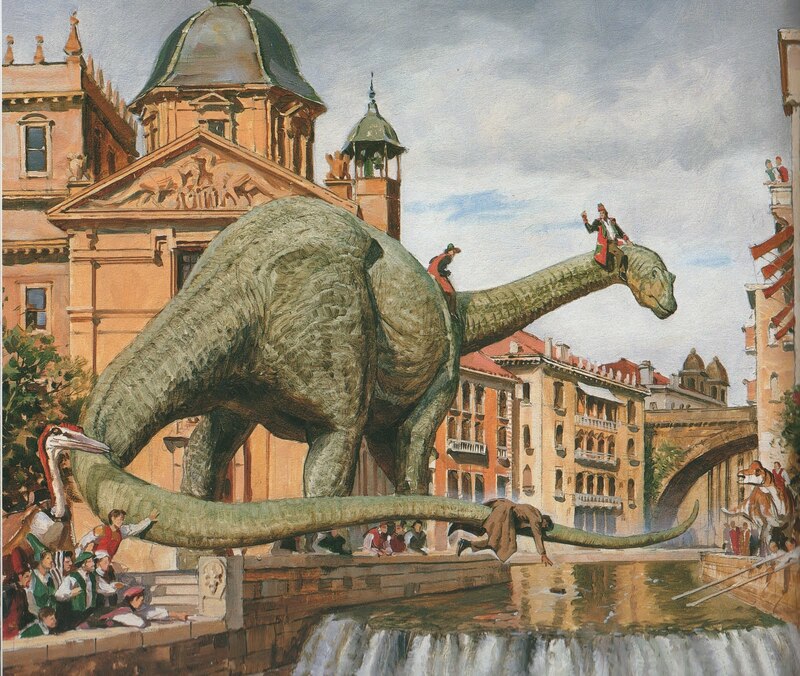 It's nice to have dinosaur friends when you've lost your thingy in the water. 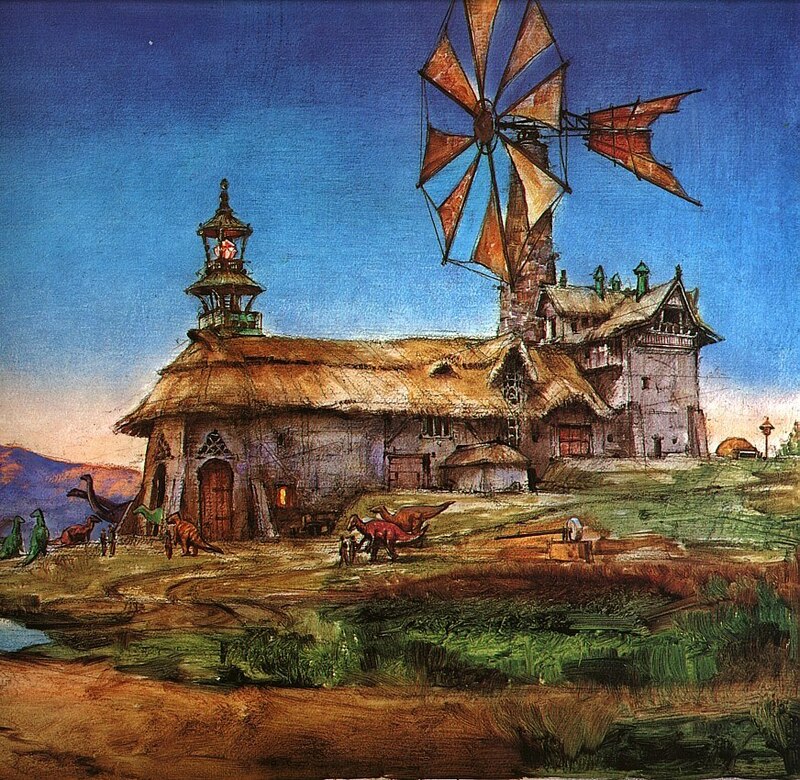 Street scene from the city of Pooktook. Gaudiesque architecture on the right. This painting was actually made before the books were written. The surroundings were later given the name of "Sauropolis", and named the capital of Dinotopia. The scene is copied for less than a second at the very end of Star Wars Episode 1. Saurpolis from above. Very classical-looking. Approaching Sauropolis from the water. Note the Triceratops head on the keystone. 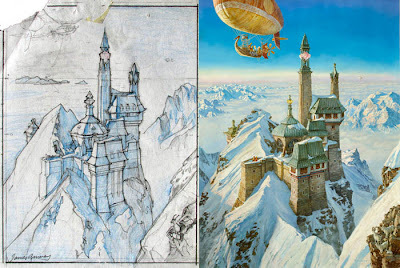 Finally, be sure to visit James Gurney's blog, from which several of these pictures were stolen.